Martin Collier, a stagehand on a seaside variety show, suspects Gerry Neon, the headline act, may be his father. When Martin learns something about his mother – a secret, a lie – he investigates her dark past and confronts his own painful history, in this gothic postcard from 1985. The son of Maurice Lee from Variety act The Grumbleweeds, James spent a childhood on the periphery of Showbiz, meeting its characters and observing their lives behind the curtain. A biology teacher, James lives with his family in Otley, West Yorkshire. The End of the Pier is his first novel. Seaside entertainment at its best. A brilliant debut, had me completely engrossed from the first chapter. Beautiful, compelling writing and a really novel (no pun intended) story. I hoovered it up. A brilliant and unique book! A wonderful coming of age story set in a remarkably authentic world of pier postcards and faded seaside glamour and with a deliciously amoral villain to boot! Dark but funny. A powerful ending - loved it !! A wonderful book with great character development. A fantastic read full of insight from someone who has seen this world first hand. An insightful, funny and dark insight into the world of seaside light entertainment. Would make a great film. A clever, funny, beautifully-written book. Its observation of both chips 'n' booze seaside tourist culture and the grime of low-level show-business is brilliant, and the slowly-darkening plot is perfectly crafted. Despite it`s rather dark theme , I found it an authentic , funny and gripping read. An excellently written debut about the interesting and rarely covered world of seaside theatre shows. James manages to find the words that you couldn't. A compulsive read and full of intrigue to the very end. Looking forward to he's second novel. A thoroughly enjoyable read which totally captured the character of the times. It left me wondering what became of the key players. A gripping and gritty novel which I found hard to put down! A well written novel with great insight and invocative description of the time. A fabulous read! 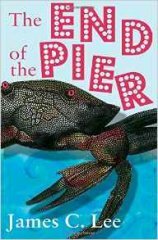 A very funny book which made me re-live a number of visits to ' end of the pier' shows with my mum many years ago. Looking forward to the sequel now. A great read. It put me right back in the 80's. A superb first novel. One of the best books I've read this year. I really enjoyed this book, it was both interesting and darkly funny. The ending was very satisfying. Gets my vote!